Kersplatt! is a hilarious, fast-paced, family board game! 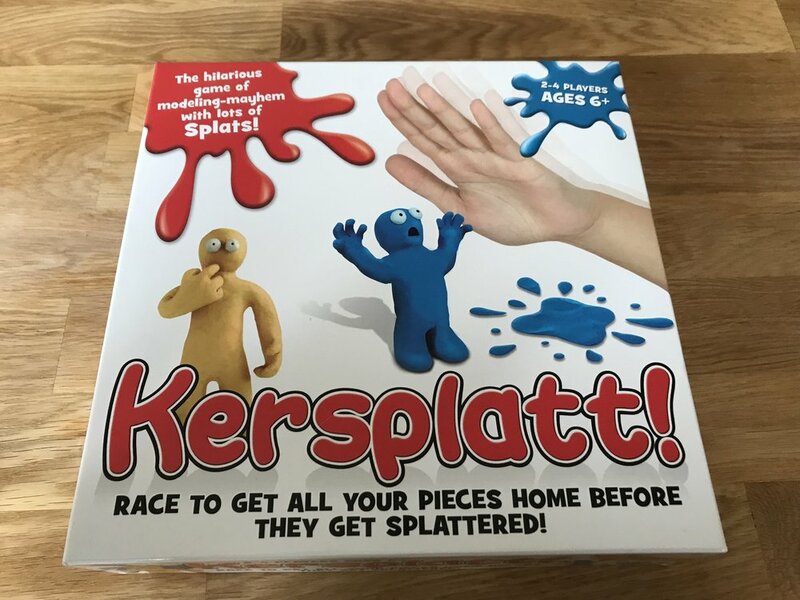 A tactile but strategic game that involve players 'Kersplatting' opponents’ creative masterpieces in the game. The first to get two play pieces home wins - it's not as easy as it sounds - the mayhem with the Kersplatting that ensues is great fun. To prepare for the game you first have to get creative and make your own play pieces with the modelling dough provided, then you are ready to commence the game. Taking it in turns to turn over a card, each player is to advance their play pieces as far as they can around the board whilst trying to stop their opponents from reaching their Home square first. a coloured number card which allows you to move your play piece to the nearest empty space either matching the colour of the card or the number on the card. Two colours card allow you to choose the colour that advances you the further around the board. The Kersplatt / colour card; with this card you can choose to either advance to the further colour space or take your hand, starting from your own start space, travel along the path until you reach the first opponent’s play piece and Kersplatt it! If a play piece has been Kersplatted it remains on the board making that square a dead space that cannot be landed on. Kersplatt! is a fantastically fun game to play. We've played it a few times now and each time it is so much fun. The kids favourite part is getting to flatten aka Kersplatt the play pieces. You can play with 2-4 players and recommended for players age-6 years+. I've teamed up with Paul Lamond Games to give one lucky reader the chance to win Kersplatt!. To be in with a chance to win, follow the instructions via Rafflecopter widget below. Good luck.